Home » Blog » How to solve questions based on At least n in Set Theory for CAT Exam? Questions based on Set Theory can get immensely complicated when you add conditions based such as ‘At least 2’ ‘At most 3’ etc. in them. To be honest, you should be absolutely comfortable with questions dealing with 3 sets and know enough to draw the Venn-diagram in case of 4 sets. 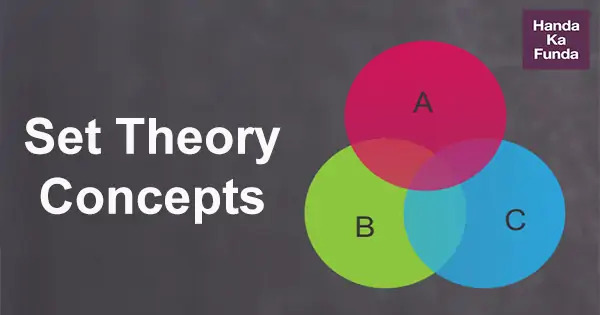 We dealt with the idea of Minima and Maxima in Set Theory in this post. Beyond that not much is required, at least for the CAT exam. Question 1: 70% of the people like Coffee, 80% of the people like Tea; then at least what % of people like both? The reason behind this is pretty straight forward. If you consider a total of 100 individuals, 70 of them like coffee. The remaining 30 don’t like coffee. Let us assume that all 30 of these like tea but we still need 50 more people to like tea. Where are those 50 going to come from? They are going to come from the coffee drinkers because there is no one else left. The surplus of 50 needs to be adjusted inside the coffee drinkers. That is the reason that 50% of people like both Tea and Coffee. Question 2: 70% of the people like Coffee, 80% of the people like Tea, 85% of the people like Milk; then at least what % of people like all three? The explanation for the first part is similar to what we had discussed in question 1. Now, on one side (let’s call it the left) we have 50 people who like both Tea and Coffee and on another side (let’s call it right) we have 50 people who do not. We need a total of 85 who like milk. We can pick them from anywhere but our end goal is to have the number of people who like all three (Tea, Coffee, and Milk) to be minimum. So, what we are going to do is that we are first going to select the 50 people on the right (who do not like both Tea and Coffee). We still need 35 more people. These 35 people are going to come from the left (who like both Tea and Coffee). So, whatever arrangement we make – we are going to end up with at least 35 people who like all three. I have shown this method just to highlight the fact that the order we take is of no significance. This is a shortcut that we can use to get the answer to such questions quickly. All you need to do is to add up the values individually and subtract (n-1) times 100 from it to get the result. Let’s take another example to highlight this method. Question 3: 70% of the people like Coffee, 80% of the people like Tea, 85% of the people like Milk, 90% of the people like Vodka, 95% of the people like Whisky, 98% of the people like Beer; then at least what % of people like all six? Once again, the order does not matter. You could have taken these in any order that you liked. Question 4: Applicants for the doctoral programmes of Ambi Institute of Engineering (AIE) and Bambi Institute of Engineering (BIE) have to appear for a Common Entrance Test (CET). The test has three sections: Physics (P), Chemistry (C), and Maths (M). Among those appearing for CET, those at or above the 80th percentile in at least two sections, and at or above the 90th percentile overall, are selected for Advanced Entrance Test (AET) conducted by AIE. AET is used by AIE for final selection. What best can be concluded about the number of candidates sitting for the separate test for BIE who were at or above the 90th percentile overall in CET? I hope that after going through this blogpost, you will be able to solve such questions in Set Theory pretty quickly. Best of luck for the upcoming exams! Quantitative Aptitude – Modern Maths – Progressions – Q3: Let a1, a2, a3, a4, a5 be a sequence of five consecutive odd numbers. Consider a new sequence of five consecutive even numbers ending with 2a3.